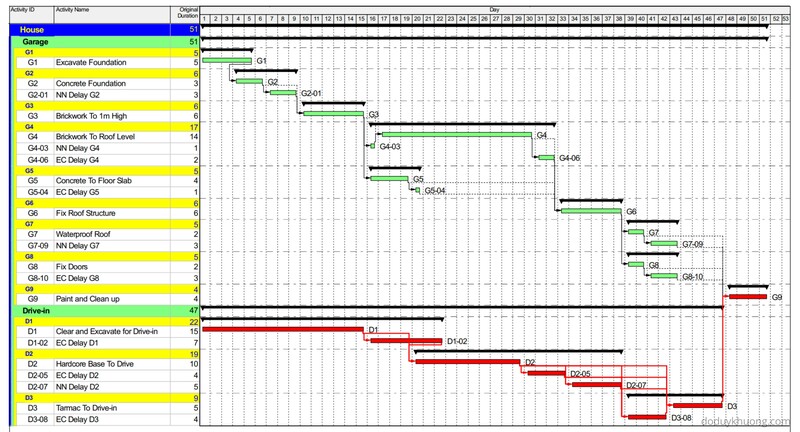 An Collapsed As-Built / As-Built But-For Schedule Delay Analysis (ABBF) is a retrospective CPM schedule delay analysis technique that determines the earliest date that the required project completion activity, or various milestone activities could have been achieved but-for the owner-caused delays that occurred during the project. The amount of owner-caused delay determined from the ABBF Schedule Delay Analysis quantifies the contractor’s entitlement to receive compensable delay damages. 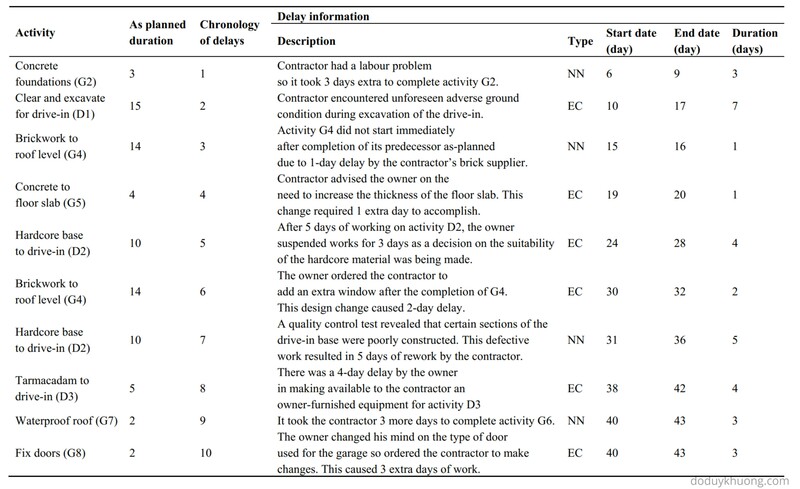 Similarly, the analysis could determine the earliest date that the various completion activities could have been achieved but-for the contractor-caused noncompensable delays that occurred during the project. 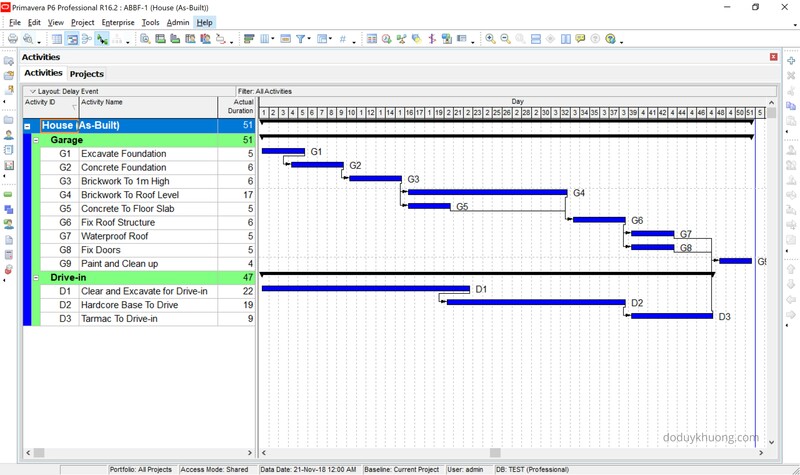 The ABBF Schedule Delay Analysis is typically more difficult to perform than the Time Impacted Analysis because most CPM software programs regard as-built dates as historical events fixed in time. As a result, most CPM software programs will not permit but-for analysis models to be run on schedule containing actual dates. Consequently, the as-built schedule must be converted to an as-planned format containing “planned” dates that correspond to the as-built schedule but are driven by logic and activity durations. 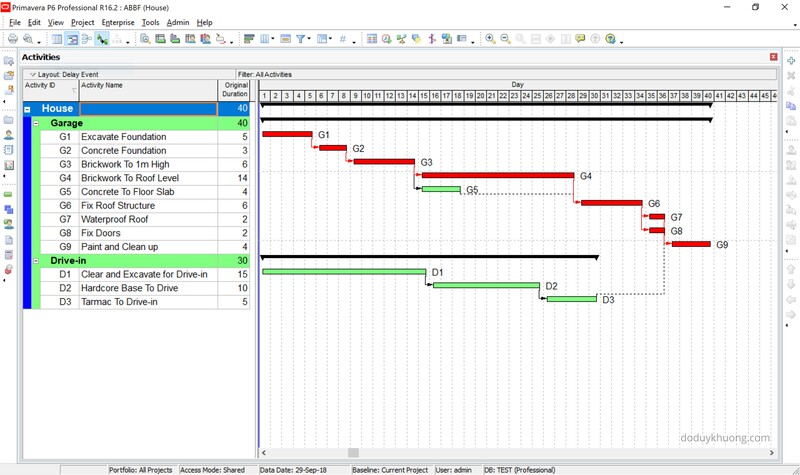 This conversion step is used to create an As-Built Calculation Schedule that can collapse as delays are removed. 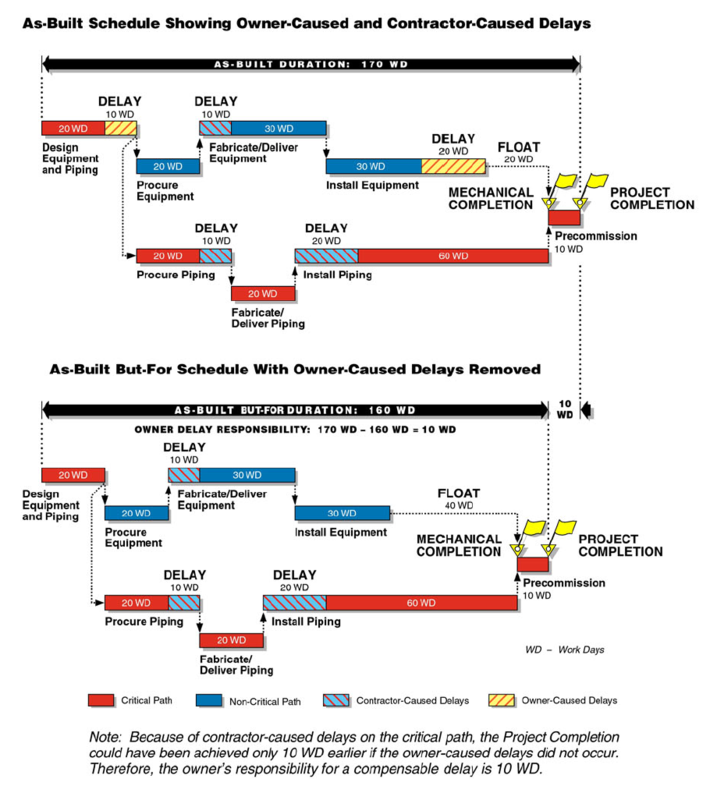 The ABBF Schedule Delay Analysis is performed by first removing owner-caused delays from the As-Built Calculation Schedule and recalculating the project completion date. Contractor-caused (noncompensable) and excusable (force majeure, acts of God…) delays are left in the As-Built Calculation Schedule. The As-Built Calculation Schedule with owner-caused delays removed is used to determine the compensable time period between the actual project completion date and the as-built but-for completion date. Next, contractor-caused delays are removed from the original As-Built Calculation Schedule and the project completion date is recalculated. Owner-caused (compensable) and excusable (force majeure, acts of God…) delays are left in the As-Built Calculation Schedule. The ABBF Schedule Delay Analysis that removes contractor-caused delays is used to determine the time period between the actual completion date and the as-built but-for completion date for assessment of liquidated damages by the owner. It is a common misconception in the construction industry that if the contractor is entitled to an extension of time, then it is also automatically entitled to be compensated for the additional time that it has taken to complete the contract. It is usually not. An additive delay analysis, such as the Time Impacted Analysis, by itself does not provide an answer to the issue of compensable delay. If a contractor incurs additional costs that are caused by both owner delay and concurrent contractor delay, then the contractor should only recover compensation to the extent it is able to separately identify the additional costs that were only caused by the owner delay. If it would have incurred the additional costs in any event as a result of concurrent contractor-caused delays, the contractor will not be entitled to recover those additional costs unless provided otherwise in the contract. Therefore, the ABBF Schedule Delay Analysis is often performed to address the issue of compensable delay net of concurrent contractor-caused delay on the as-built schedule, which the Time Impated Analysis do not analyze properly. Source: As-Built But-For Schedule Delay Analysis – Richard J. Long, P.E. – Long International, Inc.
We will demonstrate this method by using a simple House project as below. Project duration is 40 days. Actual project duration is 51 days. 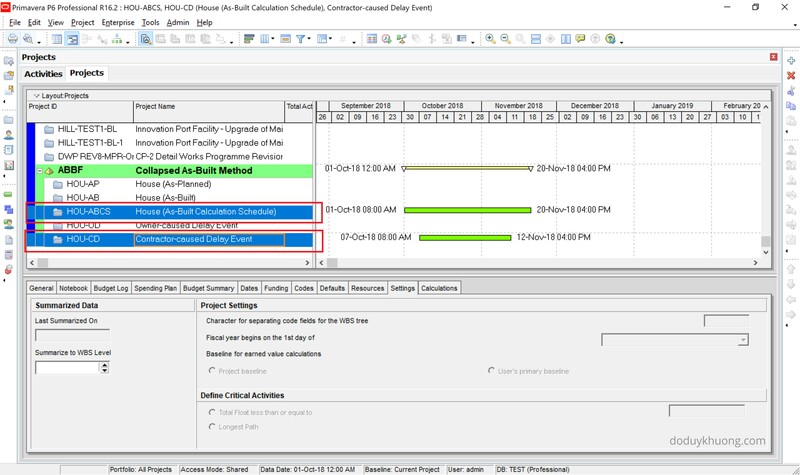 Separate delay events to a different project so that later we can exclude them. We can see that Start/Finish date (of each activity and whole project) and relationship of As-Built Calculation Schedule now look exactly the same with As-Built schedule. Under this, all owner-caused delays were subtracted from the As-Built Calculation Schedule. The collapsed as-built schedule has completion date as day 45. With actual completion date as day 51, the owner is responsible for 6 days (51–45) of the project delay, which could be charged as compensable delay. With original (baseline) completion date as day 40, the contractor is responsible for 5 days (45–40) of the project delay. Under this, all contractor-caused delays were subtracted from the As-Built Calculation Schedule. The collapsed as-built schedule has completion date as day 46. With actual completion date as day 51, the contractor is responsible for 5 days (51–46) of the project delay, which could be charged for liquidated damages. With original (baseline) completion date as day 40, the owner is responsible for 6 days (46–40) of the project delay. 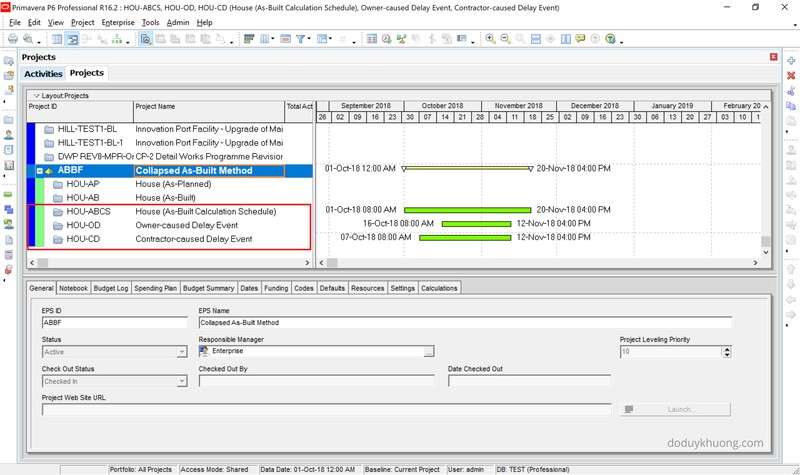 As-Built But-For Schedule Delay Analysis – Richard J. Long, P.E. – Long International, Inc. The articles about primavera p6 is very userful , Can I translate those article to Chinese and post in my blog， I will show the link to your website??? thank you very much..
I’m very happy when you enjoy this article. Yes, absolutely you can, as long as there is a link back to this post. This is an oversimplification of the most complex aspect of performing real world collapsed as built analysis in P6. Whilst this may be a straightforward process for a 40 line program, for a 4,000 line program this is a far more complex task. Once actuals are removed, you need to ensure that the “as planned” logic (ie the logic in the As-Built Calculation Schedule) matches the “as built” logic perfectly – logic that represents what actually happened. If during the course of the project any activity broke away from the planned logic, and unless a delay event exists, this will be lost once scheduled. An example here would be that an activity with a FS relationship due to unforeseens managed to start say FS-2d during the project. Unless this -2 lag logic is manually entered for this activity, then upon scheduling, the logic will revert to the as planned logic, and the as built “fact” (ie -2d lag) is lost. In a perfect world the planner will update logic to as-built logic when updating activity status, however in my experience this is simply never the case (an on large complex projects, simply too difficult). Unless this condition is true, the As-Built Calculation Schedule will look in no way like the as-built program upon scheduling. I greatly appreciate any post on P6 delay analysis, and your post is excellent – I just want to add a warning, especially to new comers that this is a complex process full of traps, so tread carefully. Thanks for your sharing. It’s really helpful. 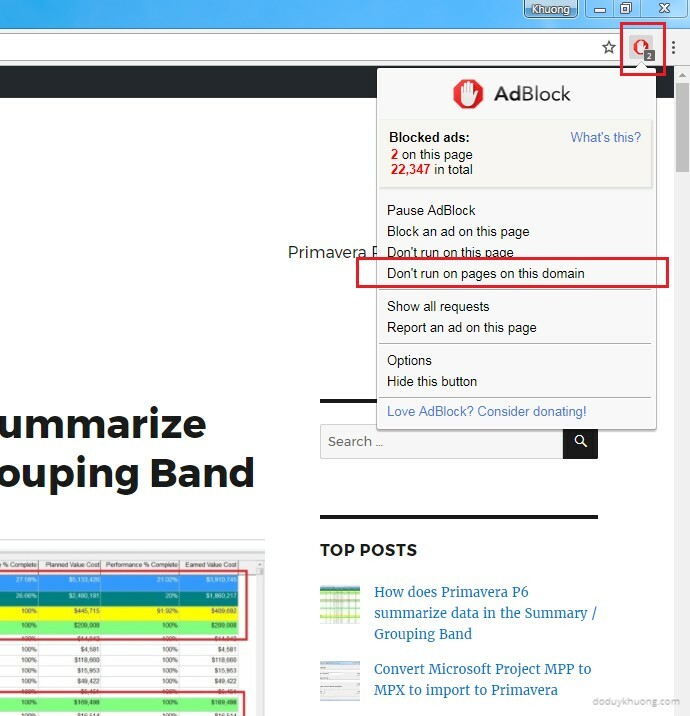 Yes I agree that this method is quite complicated and need lots of resource to do it. That’s why we should consider the Budget and time allocated for the claim report before start to do it. A large and complex project may take up to 1 year and millions of dollars to finish the claim report.